When you see what it has to offer, a Dragon Medical Practice Edition 2 upgrade will prove to be a good move for your medical practice. If you and other providers in your practice are already using the software, imagine it transcribing even faster and smarter, which translates into more reimbursement, more comprehensive and accurate notes, and the ability to achieve meaningful use data more quickly. That means more time spent on patients and practice management. The Dragon Medical Practice Edition upgrade does this with a bunch of new features and enhancements. For starters, it corrects and works faster due to The addition of new processor optimization. It also has updated internet applications; it can now support Gmail, Hotmail, and Outlook mail, and its Rich Internet Application (RIA) extensions are available in Microsoft Explorer version 9 and 10 (32-bit only), Mozilla Firefox and Google Chrome. The improved text-to-speech technology is more natural sounding and reads editable text, has a fast-forward rewind, and speed and volume control to make proofing and multitasking a little easier. And when you’re ready, Dragon Medical Practice Edition 2 has the same look and feel as your current version so your practice can start seeing ROI with little, if any downtime. 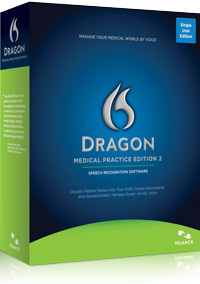 If you have any edition of Dragon Medical 10, it’s important to know that to remain eligible to upgrade your Dragon Medical software you need to upgrade to Dragon Medical Practice Edition 2 prior to the next release of Dragon Medical Practice Edition. Nuance has a two version limit for upgrade pricing, so if you fall more than two versions behind the current Dragon Medical version, you will no longer be eligible for the upgrade pricing and must then “re-purchase” a Dragon Medical license at the regular price in order to acquire a newer version. So instead of putting it off, remember that the Dragon Medical software you currently use has probably made your life easier and an upgrade could make it a whole lot easier.